A typical Monday. We start with me running a load of molasses out to our farm for the cattle. We use molasses with a mix of other supplements to help the cattle digest the older dry grass during the winter months to help them maintain condition and ensure that they’re at their best going into the growing season during spring, summer and autumn. I generally do one to two molasses runs a week. 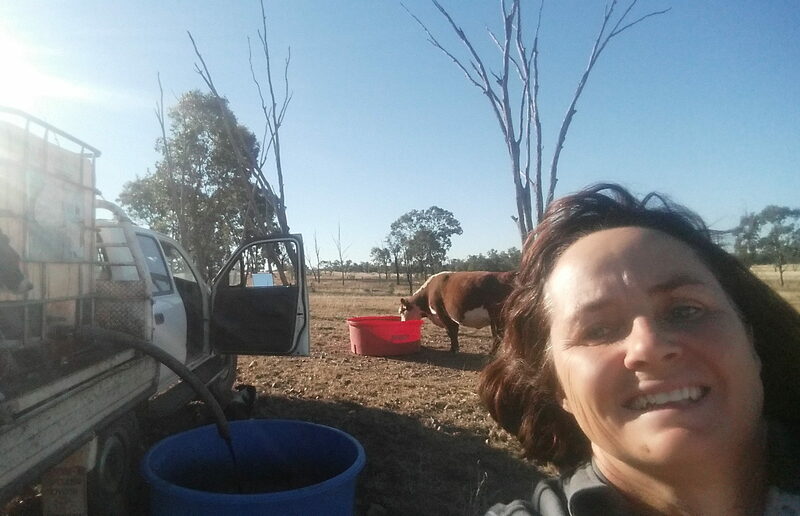 Then back to town, feed the horses and sheep close to the farm house, a quick shower, drop my youngest to school (the oldest is at uni) and off to the office where I’m the Business Manager, for our ecological consulting, plus ecotour businesses. Business Manager in a small business like ours is code for “Jack of All Trades”. I’m responsible for the strategic direction of the business, human resources, finances (budgets and book keeping), marketing and project development; as well from time to time heading out to the field to give a hand if we’re a bit short staffed. Our most valued resource within our business is our team of personnel. Everyone brings something a little different to the group and we really try to build on people’s strengths and involve them in all aspects of the business. With the downturn in the gas industry during 2015 and 2016, Craig & I did everything possible to make sure we retained our team. Based on finances alone we should have put off at least two to three people during this eighteen month period, however, we made a business decision to take a hit ourselves and to keep everyone on board. We had faith that the business would grow again and it was more important for us to retain our existing skill set and use the time to explore other business options, which would help to “drought proof” and diversify us during future industry downturns. I think coming from a farming background has put us in good stead to deal with these situations, as we are very used to the ups and downs of markets and weather and doing what we need to do to make ends meet. So a typical day at work for me generally involves your normal office work – answering enquires having meetings with project teams and external companies that might be supporting some of our internal operations like website developers, writing project proposals, writing or reviewing procedures, submitting tenders and pre-qualification information for upcoming work, paying bills, updating the financials, meeting with staff, writing some blogs, doing some volunteer work for a local junior touch that I am currently the president/coordinator for and so on…you get the idea. No two days are the same. During the day it is also not uncommon to answer a couple of wildlife calls – go and pick up an injured joey or remove an echidna from someone’s backyard. The snake calls I like to leave to someone else in the team if I can get away with it, however, often they will all be in the field so I’m the last resort. Because of all the enquires we get from the public in relation to injured, sick or orphaned wildlife we set up a not-for-profit charitable wildlife caring group (MWCEC) and have some wonderful volunteer carers that take in the animals requiring longer term care. As a business though we continue to support this group both in dollar and in-kind terms and currently remain the “drop off” centre in the Roma/Maranoa region for wildlife brought in by the public. One thing I’m a little remiss about at the moment is the lack of exercise. Even though the day is busy and after an ankle injury six months back now, I’m still struggling to get back on track with exercise to help my body and mind function to full capacity. I think I just need to say out loud I’m starting “now” and make it happen…although it is also very easy to think “tomorrow” I’ll start. Any suggestions, I’d love to hear them.